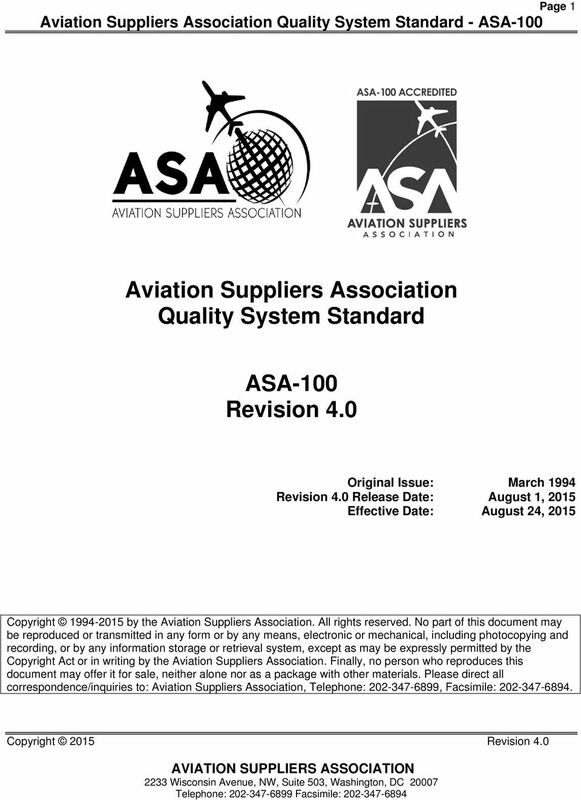 Download "Aviation Suppliers Association Quality System Standard. 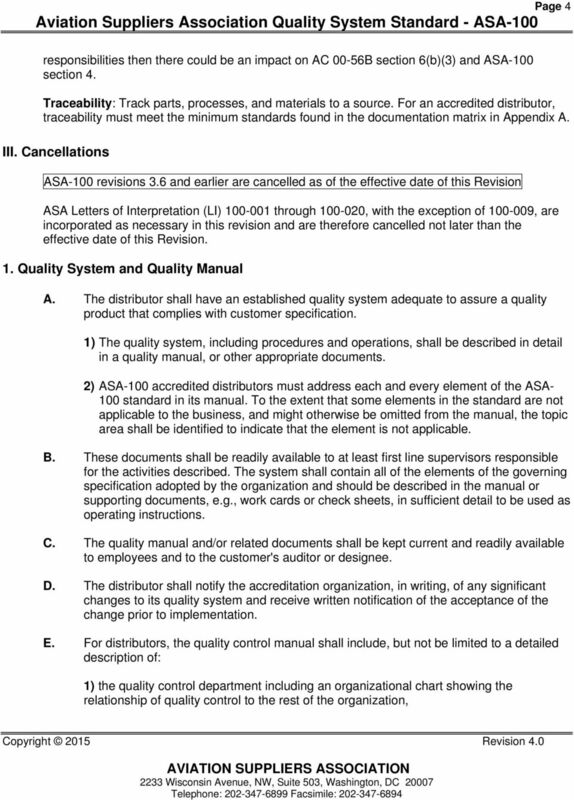 ASA-100 Revision 4.0"
9 Page 9 8. Material Control standard against which it was calibrated. Current documentation of calibration status shall be maintained. A. Material Handling: Material shall be handled in an appropriate manner and shall be protected from damage and deterioration. Special packaging shall be maintained as necessary. The storage area for aircraft parts should be periodically checked for overall effectiveness of storage and identification methods. B. Batch/Lot Control: Batch segregation shall be maintained for parts so identified by the manufacturer, such as aircraft fasteners. The system shall include procedures for splitting of lots and the documentation of such splitting. Purchases, less sales, should equal inventory, which shall balance on batch/lot numbered inventories. C. Recall Control: The distributor shall maintain records for parts identified by batch number and the quantities sold from each batch to each customer, to facilitate a manufacturer's recall notification, if required, which ensures that parts shipped can be traced and recalled. D. Packaging: Whenever practical, materials shall be stored and delivered in the manufacturer's original packaging. Packaging shall identify the manufacturer, distributor, part number, serial number, lot or batch number (if applicable), and the quantity. 1) The distributor shall use ATA Specification 300 packaging or equivalent, or customer specified packaging when appropriate. If practical, environmentally friendly packaging material should be utilized. Flammable, toxic, or volatile materials shall be packaged in a safe manner per manufacturer's recommendations or as specified by local regulations. E. Electro-Static Sensitive Devices: Material subject to damage from electro-static discharge shall be packaged, handled, and protected with necessary precaution and in accordance with requirements for safe handling of electro-static sensitive devices. For additional information see ASA Best Practice ESD Best Practice. F. Storage of Parts: The distributor quality system shall assure that serviceable parts/components are adequately protected against the environment and damage by being properly wrapped, packaged, boxed, etc., as appropriate. All fluid passages, lines, or electrical connections shall be capped or plugged. The distributor's quality system shall protect items whose performance will be adversely affected by an "unclean" environment. G. Part Numbering: The distributor shall ensure that no part number ambiguity exists. Parts shall not be labeled with multiple part numbers if such labeling could cause confusion as to the part's manufacturer or applicable specification. A distributor's alteration to or replacement of the data plate or manufacturer's part number is unacceptable, unless authorized by the FAA or an FAA certificate holder. 10 Page 10 H. Non-Conforming Materials: The distributor quality system shall have a procedure for removing suspect or nonconforming material that is identified during receiving inspection (or later), and placing the removed material in a separate area until such suspicion or nonconformance can be properly resolved through the Corrective Action Process. The separate area may be physically segregated or it may be procedurally segregated, as long as the segregation is effective in preventing inadvertent sale or transfer of the suspect or nonconforming material prior to the identification of an appropriate disposition. 1) Aircraft parts, and parts that could be reasonably assumed to be sold for aircraft use, shall be segregated from non-aircraft parts. I. Scrapped Parts: There shall be a documented procedure in place to mutilate scrapped parts by drilling, grinding, or other appropriate means. When the distributor chooses to scrap a part, the part shall be mutilated to the extent necessary to preclude the possibility of it being restored and returned to service. For additional information see ASA Best Practice Disposition of Unsalvageable Aircraft Parts. 1) The distributor shall maintain a record of all serialized and/or life-limited parts scrapped out. The record shall contain a description of the part, its part number, serial number (if applicable), and the date the part was scrapped. The distributor shall retain this record for at least seven years. Retaining any other records for the scrapped parts shall be at the discretion of the distributor. 2) The procedure shall identify, by title or position, the individual responsible for verifying that parts were adequately mutilated before being discarded. 3) The distributor shall impose these same requirements on their subcontractors and/or repair facilities that scrap parts as agents of the distributor. J. 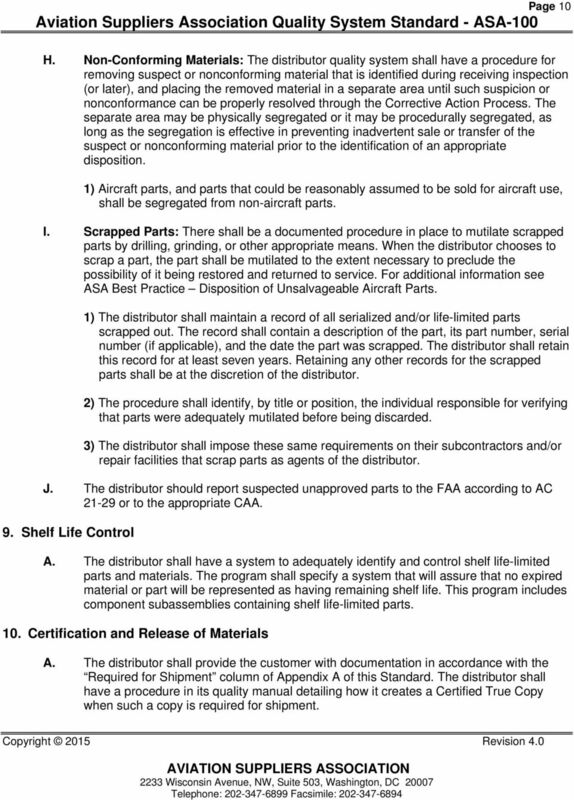 The distributor should report suspected unapproved parts to the FAA according to AC or to the appropriate CAA. 9. Shelf Life Control A. The distributor shall have a system to adequately identify and control shelf life-limited parts and materials. The program shall specify a system that will assure that no expired material or part will be represented as having remaining shelf life. This program includes component subassemblies containing shelf life-limited parts. 10. Certification and Release of Materials A. 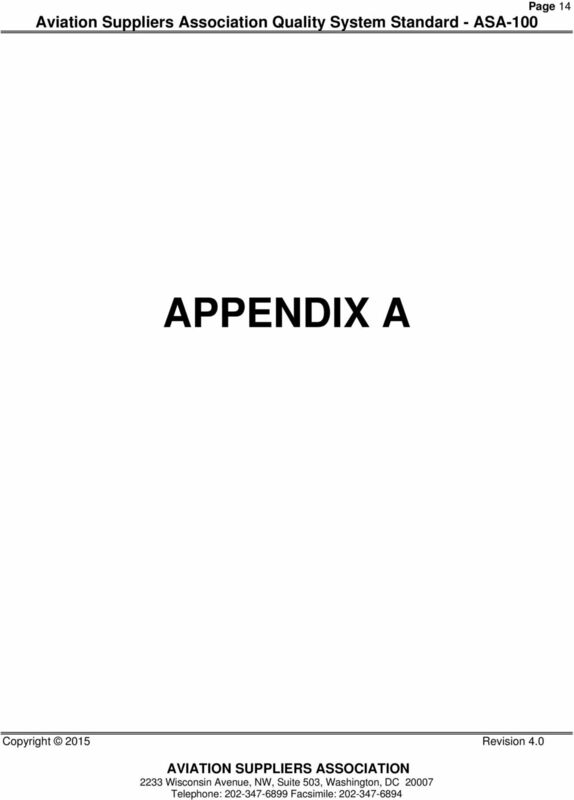 The distributor shall provide the customer with documentation in accordance with the Required for Shipment column of Appendix A of this Standard. The distributor shall have a procedure in its quality manual detailing how it creates a Certified True Copy when such a copy is required for shipment. 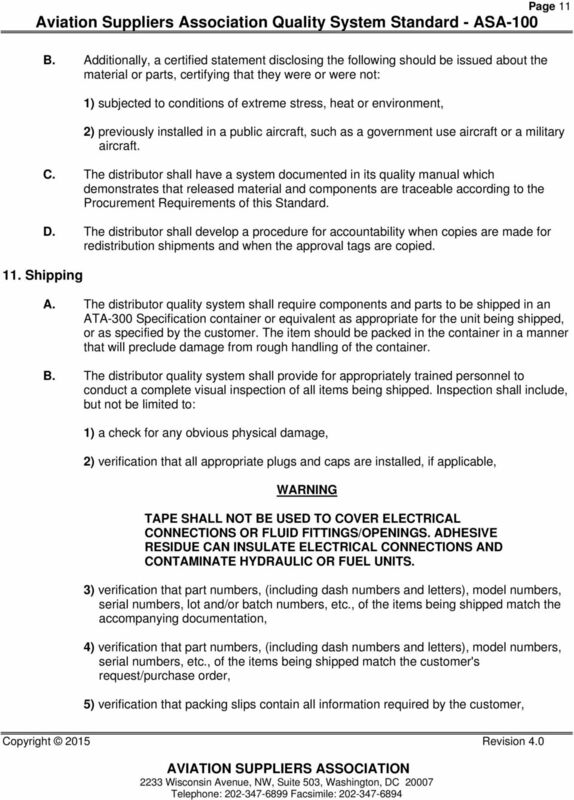 15 Page 15 APPENDIX A DOCUMENTATION MATRIX CLASS OF PARTS REQUIRED ON RECEIPT REQUIRED FOR SHIPMENT Consumable materials intended to be consumed in the maintenance, Statement from seller as to identity. Statement as to identity and that original seller s statement is on file. alteration, or preventive maintenance of a product or article (e.g. tape, grease, paint, sealant, etc.). Raw materials. Physical and chemical properties reports Certified true copy of the physical Standard parts. New parts produced by a U.S. type certificate (TC) holder and produced under TC only. 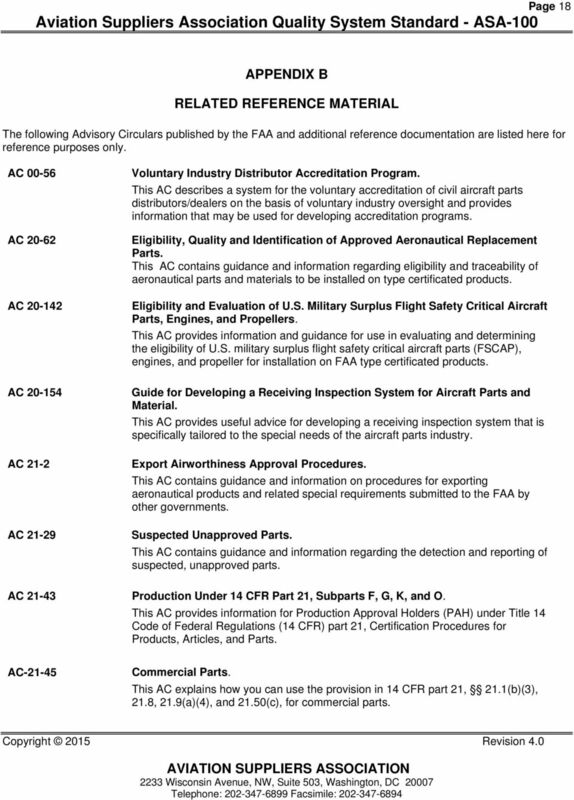 New parts produced by a U.S. Production Approval Holder (PAH) that are accompanied by airworthiness approval or that bear part marking required by 14 CFR part 45. 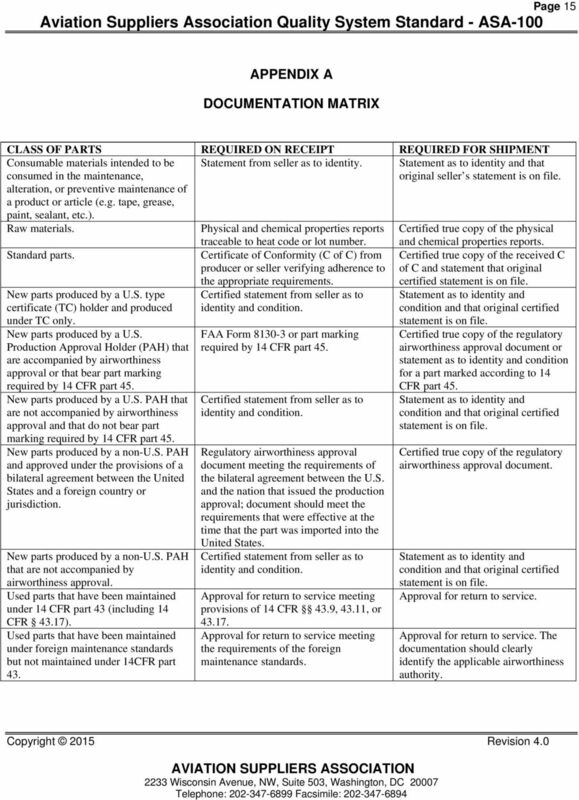 New parts produced by a U.S. PAH that are not accompanied by airworthiness approval and that do not bear part marking required by 14 CFR part 45. New parts produced by a non-u.s. PAH and approved under the provisions of a bilateral agreement between the United States and a foreign country or jurisdiction. New parts produced by a non-u.s. PAH that are not accompanied by airworthiness approval. Used parts that have been maintained under 14 CFR part 43 (including 14 CFR 43.17). Used parts that have been maintained under foreign maintenance standards but not maintained under 14CFR part 43. traceable to heat code or lot number. Certificate of Conformity (C of C) from producer or seller verifying adherence to the appropriate requirements. Certified statement from seller as to identity and condition. 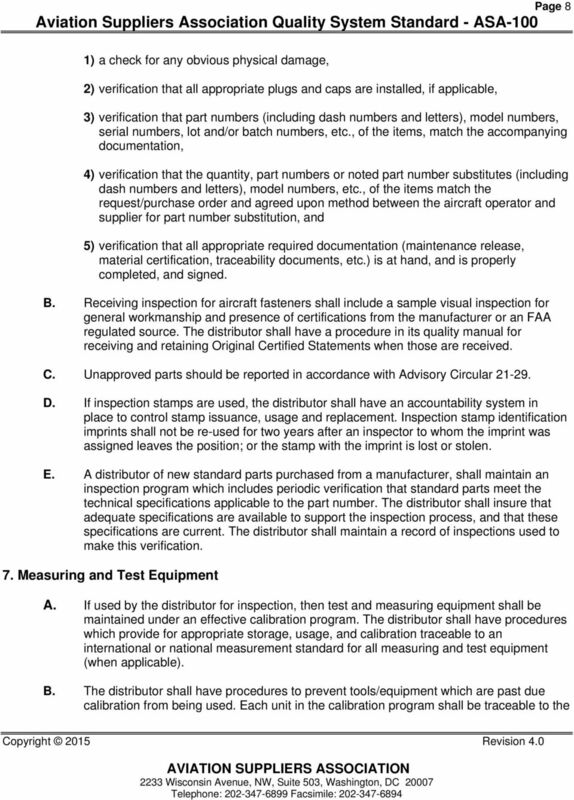 FAA Form or part marking required by 14 CFR part 45. Certified statement from seller as to identity and condition. Regulatory airworthiness approval document meeting the requirements of the bilateral agreement between the U.S. and the nation that issued the production approval; document should meet the requirements that were effective at the time that the part was imported into the United States. Certified statement from seller as to identity and condition. Approval for return to service meeting provisions of 14 CFR 43.9, 43.11, or Approval for return to service meeting the requirements of the foreign maintenance standards. and chemical properties reports. Certified true copy of the received C of C and statement that original certified statement is on file. Statement as to identity and condition and that original certified statement is on file. Certified true copy of the regulatory airworthiness approval document or statement as to identity and condition for a part marked according to 14 CFR part 45. Statement as to identity and condition and that original certified statement is on file. 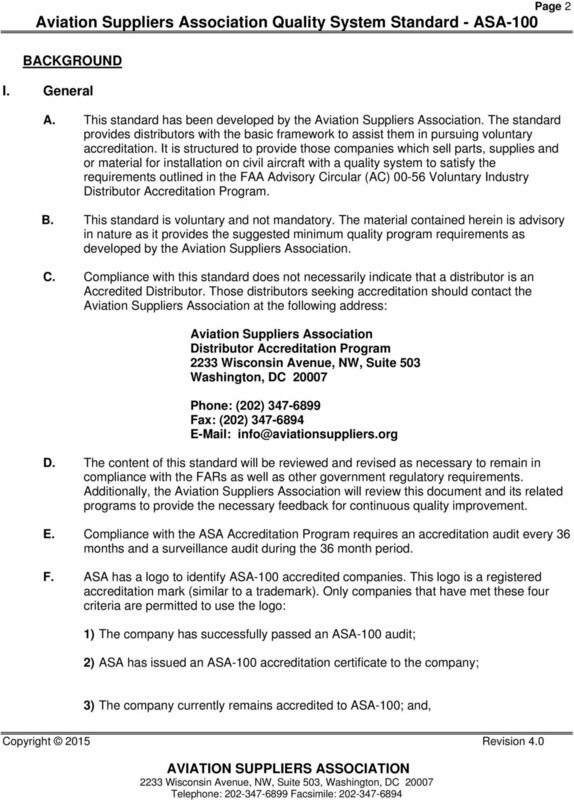 Certified true copy of the regulatory airworthiness approval document. Statement as to identity and condition and that original certified statement is on file. Approval for return to service. Approval for return to service. The documentation should clearly identify the applicable airworthiness authority. 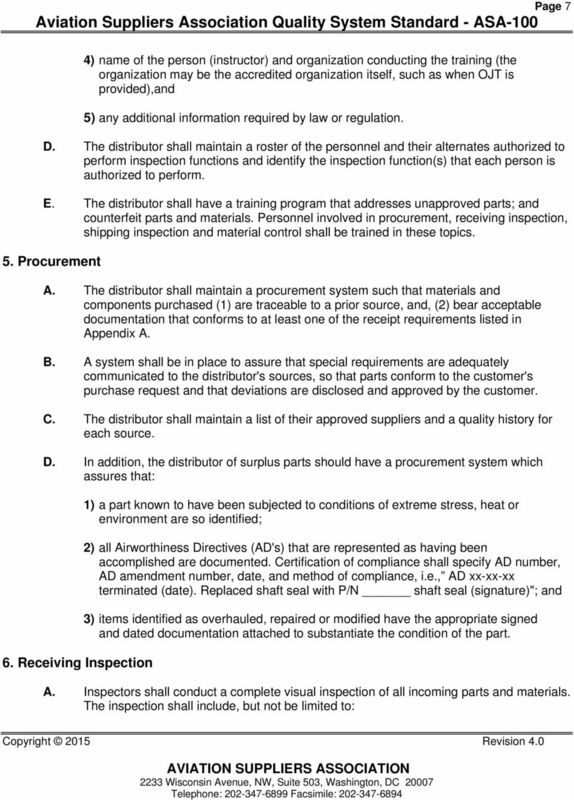 16 Page 16 CLASS OF PARTS REQUIRED ON RECEIPT REQUIRED FOR SHIPMENT Used parts, products, and appliances without approval for return to service. 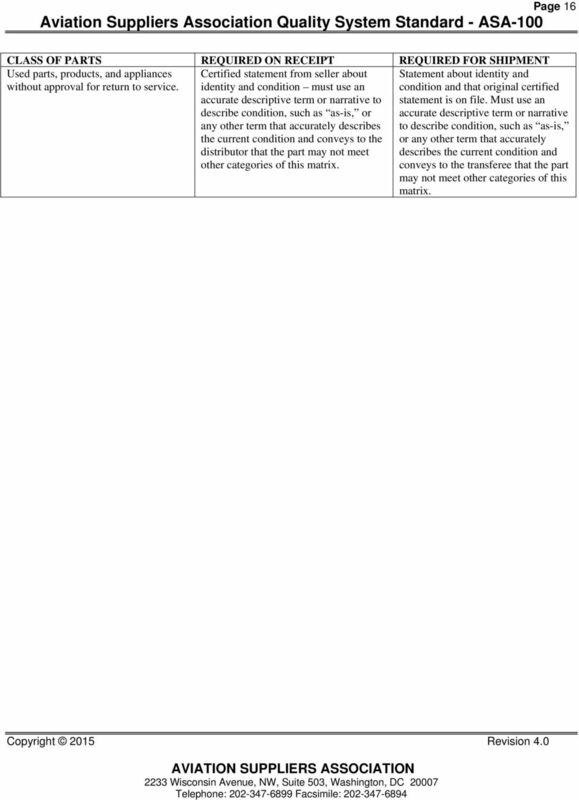 Certified statement from seller about identity and condition must use an accurate descriptive term or narrative to describe condition, such as as-is, or any other term that accurately describes the current condition and conveys to the distributor that the part may not meet other categories of this matrix. Statement about identity and condition and that original certified statement is on file. Must use an accurate descriptive term or narrative to describe condition, such as as-is, or any other term that accurately describes the current condition and conveys to the transferee that the part may not meet other categories of this matrix. 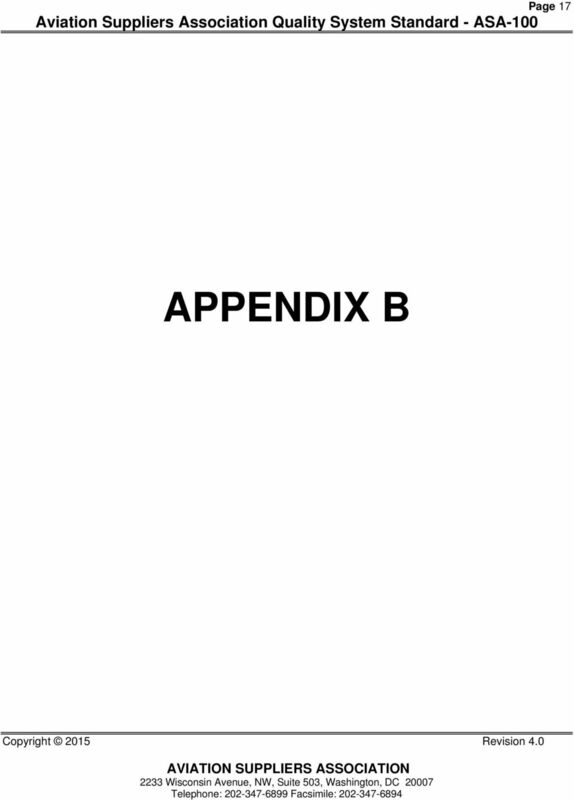 18 Page 18 APPENDIX B RELATED REFERENCE MATERIAL The following Advisory Circulars published by the FAA and additional reference documentation are listed here for reference purposes only. AC AC AC AC AC 21-2 AC Voluntary Industry Distributor Accreditation Program. This AC describes a system for the voluntary accreditation of civil aircraft parts distributors/dealers on the basis of voluntary industry oversight and provides information that may be used for developing accreditation programs. Eligibility, Quality and Identification of Approved Aeronautical Replacement Parts. This AC contains guidance and information regarding eligibility and traceability of aeronautical parts and materials to be installed on type certificated products. Eligibility and Evaluation of U.S. Military Surplus Flight Safety Critical Aircraft Parts, Engines, and Propellers. This AC provides information and guidance for use in evaluating and determining the eligibility of U.S. military surplus flight safety critical aircraft parts (FSCAP), engines, and propeller for installation on FAA type certificated products. Guide for Developing a Receiving Inspection System for Aircraft Parts and Material. This AC provides useful advice for developing a receiving inspection system that is specifically tailored to the special needs of the aircraft parts industry. Export Airworthiness Approval Procedures. This AC contains guidance and information on procedures for exporting aeronautical products and related special requirements submitted to the FAA by other governments. Suspected Unapproved Parts. This AC contains guidance and information regarding the detection and reporting of suspected, unapproved parts. AC Production Under 14 CFR Part 21, Subparts F, G, K, and O. This AC provides information for Production Approval Holders (PAH) under Title 14 Code of Federal Regulations (14 CFR) part 21, Certification Procedures for Products, Articles, and Parts. AC Commercial Parts. This AC explains how you can use the provision in 14 CFR part 21, 21.1(b)(3), 21.8, 21.9(a)(4), and 21.50(c), for commercial parts. 19 Page 19 AC AC Technical Standard Order Program. This AC contains guidance and information on the Technical Standard Order (TSO) process for manufacturers producing articles and appliances under a TSO Authorization (TSOA). Application for Parts Manufacturer Approval Via Tests and Computations or Identicality. This AC contains guidance and information to applicants for Parts Manufacturer Approval (PMA) of articles. 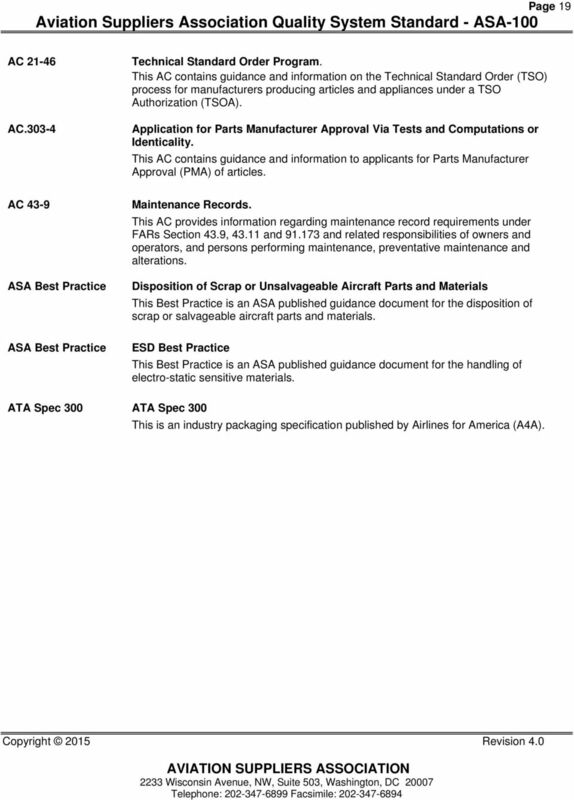 AC 43-9 ASA Best Practice Maintenance Records. This AC provides information regarding maintenance record requirements under FARs Section 43.9, and and related responsibilities of owners and operators, and persons performing maintenance, preventative maintenance and alterations. Disposition of Scrap or Unsalvageable Aircraft Parts and Materials This Best Practice is an ASA published guidance document for the disposition of scrap or salvageable aircraft parts and materials. ASA Best Practice ESD Best Practice This Best Practice is an ASA published guidance document for the handling of electro-static sensitive materials. 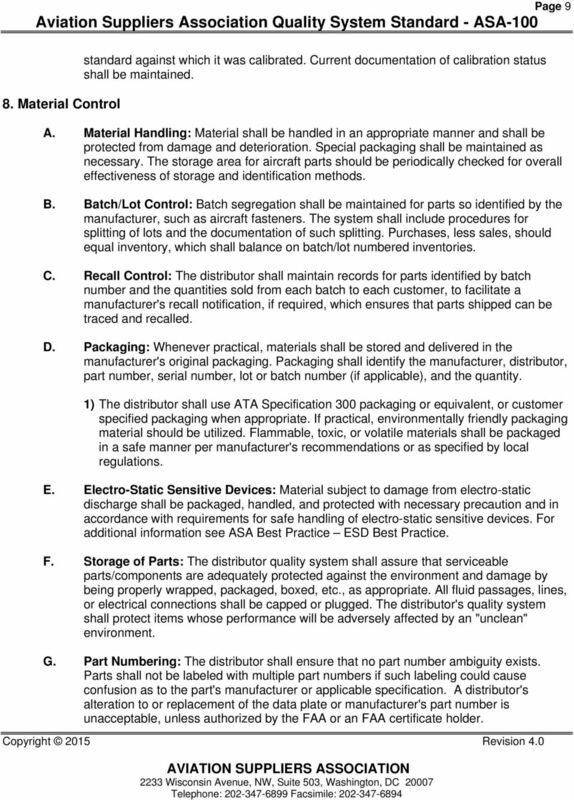 ATA Spec 300 ATA Spec 300 This is an industry packaging specification published by Airlines for America (A4A). 2. CANCELLATION. 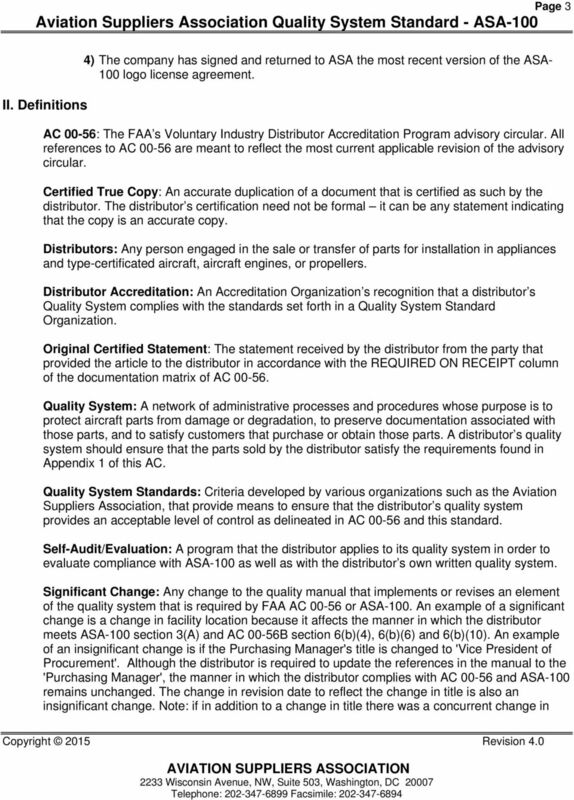 AC 20-62D, Eligibility, Quality, and Identification of Approved Aeronautical Replacement Parts, dated May 24, 1996, is canceled. D3 AVIATION USE ONLY. Conforms to requirements, procedures & control exists to control the product. 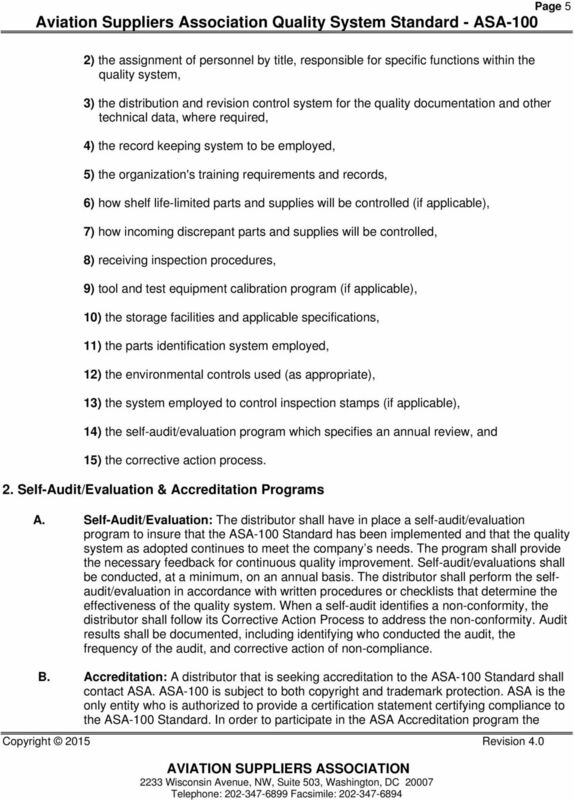 QUALITY ASSURANCE MANUAL JPM OF MISSISSIPPI, INC.
New Program Quality Requirements for Suppliers (NPQR) For Limited Manufacturing of Components and/or Processes for Engineering Certification Revision A New Program Quality Requirements for Suppliers Rev. SUPPLIER QUALITY ASSURANCE SYSTEM REQUIREMENTS SQAR 0001 REV D Supplier s Quality System David H. Trucksis Donald A. Strickland R. Christiansen PREPARED BY: REVIEWED BY: APPROVED BY: Robert W. Mullen Jr.
New Program Quality Requirements for Suppliers (NPQR) For Limited Manufacturing of Components and/or Processes for Engineering Certification Revision - New Program Quality Requirements for Suppliers Rev. 543.7 What are the minimum internal control standards for bingo? Copies of this document shall be classified either as Controlled or Uncontrolled, and shall be identified as such on the cover sheet.